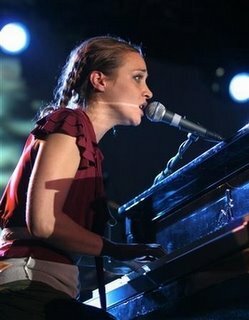 My wife and I saw Fiona Apple in concert last night, at Chastain Park Amphitheater in Atlanta. I surprised her with an early birthday gift, she was excited. I became a Fiona Apple fan in early 2005 when I found the ‘Extraordinary Machine’ bootleg online. I had heard her over the years, but never really explored her music. My wife however has loved Fiona since “Tidal” was released in 1996. Seeing Fiona Apple in concert last night gave me a completely new appreciation for her. She is one of the most passionate, expressive artists I have ever seen perform. Her music is generally filled with angst and passion, but as she sang her songs last night she appeared to be reliving the circumstances and emotions of the songs. She growled, screamed, yelled, cried, whispered and sang the words that she is obviously very connected to. Many things surprised me about the show. First of all, her lack of speaking. I am used to seeing artists talk a lot in between songs and tell stories. Not for Fiona. Everything she had to say she communicated through her singing. She finally muttered a very sincere “Thank you” after an hour of performing.” She said “Thank you” a couple more times, uttered a couple of “Wow’s” and introduced the band; that was the extent of her spoken communication with the crowd. The next thing that surprised me was that for about half the show, she did not play piano. She stood with a mic and sang while a member of her band played the piano. I had always pictured Fiona sitting behind (hiding behind?) the piano for her concert. It was weird to see her standing front and center behind a mic stand. But she definitely didn’t stand still. I wouldn’t call it dancing, but she was constantly in motion. She jumped, yelled, shook, and some points it appeared she was having a seizure. Lastly, the setlist surprised me tremendously. Fiona started with ‘Get Him Back’ from the new album, but then played 7 or 8 straight old songs. I thought it was great. I am constantly wishing my favorite artists would perform more of their older songs live, because they rarely do. Typically when I see a band I like in concert 90% of the show is songs off their newest album. I don’t blame them, but I wish it wasn’t that way. Anyway, back to Fiona. She played two songs off ‘Tidal’: ‘Shadowboxer’ and the final song of the night, ‘Criminal.’ She played either 7 or 8 songs of ‘When the Pawn…’, almost the entire album. And she played 5-6 songs of ‘Extraordinary Machine’: the title track, which was the first encore song, ‘Tymps’, ‘Not About Love’, ‘Red Red Red’, ‘Get Him Back’ and I think one other. I would love to know the actual setlist, but I don’t know the names of her songs well enough to remember. The only song she didn’t play that my wife and I really wanted to hear was ‘Window.’ The show started at 9:00 and ended at 10:30 p.m.
Before I end this post, I want to say I am frequently entertained by comparing the two versions of ‘Extraordinary Machine.’ I heard the bootleg version (Jon Brion-produced, leaked to internet in 2004) first and fell in love with it. 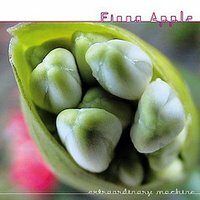 The real version (Mike Elizondo-produced) released in stores in October 2005. I initially was very disappointed with it, but now I love them both. With songs like ‘Not About Love’ and ‘Tymps’ I like the new versions better, but with ‘Red Red Red’ and ‘Window’ I think the original versions are tons better. Anyway, I recommend getting both versions. The Jon Brion one is all over the internet, you can download it for free. Then buy the Mike Elizondo version, I recommend getting it on vinyl (2 x LP). Speaking of getting music over the internet, the new Jeremy Enigk album, ‘World Waits’ has leaked and I have been listening to it a lot. It will be released on October 3. It is tons better than the Fire Theft album, and I personally like it much better than Jeremy’s first solo album, ‘Return of the Frog Queen.’ But, as you can expect, it does not touch the four Sunny Day Real Estate albums. Oh how I miss Dan Hoerner.